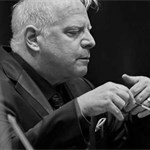 Philadelphia Orchestra Blog Interview "It Feels Like Love"
Interview with David Osenberg on WWFM "The Classical Network"
"It's hard to put into words what one composer feels like in comparison to another. I love all of these composers equally so it isn't easy to rate them, but as with any area, one has tendencies. I suppose it's similar to the way one describes their friendships. Each has its own special nature and individuality. Why do some of us prefer chocolate over vanilla, it's hard to say." A Francophile that loves to say "Oui"
"The teachers I came across said, "You have something you should treasure." I remember telling my teacher at Rice that I wished I could sound like everybody else. I wanted to sound like the sopranos, like the Queen of the Night. And she said, "it's good to be different." That really stayed with me." "With a weak economy, people often talk about how art is not as important, but in bad times, I think it's actually the other way around. Art is vital because it brings us back to our humanity, generosity and all of the things we really need to be in touch with." 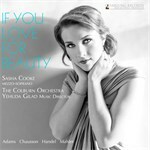 Feature Review of If you love for beauty CD in "Audiophile Audition"
truly inspiring to observe and learn from such a stunning role model, who is stellar both on and off the stage.